Five feet square?! 25 square feet? That’s a pretty small room, but it is possible if the sink is small. I grew up in a house that had a very small bathroom, but it was closer to 5’x7′ — the sink and toilet could both fit on the same wall, which at least left room for a laundry hamper. 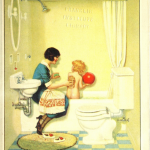 The Five Foot Square bathroom, large enough for mom and kid… barely. 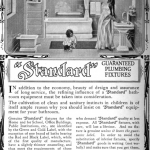 Prices and information about the “Mother and Child” five foot square bathroom. 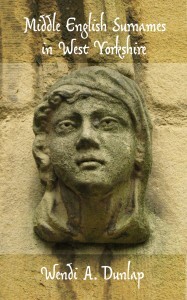 Slightly different from the color version on the catalog’s cover; this one shows the tilework with a dark stripe near the top of the wall. 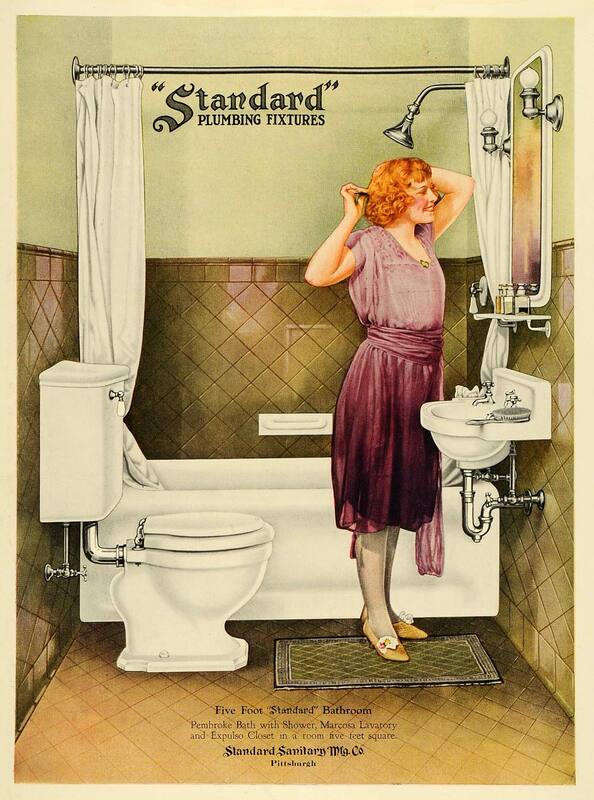 Another early 1920s ad for a bathroom that may be tiny, but it looks elegant with its iridescent dark tile work and red carpet. Another version of the five Foot Square bath. “Oh how she had longed for a bathroom all her own” — the freedom of not sharing a bathroom, by installing one in a five foot square space. “Ample bathroom facilities are not a luxury.” Though the room is small, it has rose tiles and a checked linoleum floor, with elaborate light fixtures. 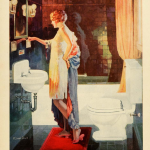 Oh how she had longed for a bathroom all her own — where she could take her own sweet time, knowing it would not be remarked upon — confident that others were not being inconvenienced. How hard it is to use a bathroom on schedule! 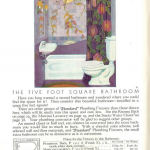 The bathroom in this ad, though tiny, had a sense of feminine luxury, with rose-colored tilework, golden sconces with aqua shades, and a butterfly area rug. 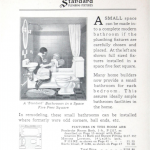 Unspoken in the Five Foot Square ad campaign was something else — if you can install a full bathroom in such a small space, you can easily add bathrooms to homes that previously didn’t have indoor plumbing. 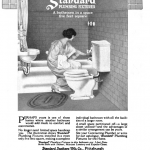 1919 Standard ad, with a maid fixing milady’s hair while she sits in a chair in a reasonably spacious bathroom. This largish bathroom has a foot bath along with more common fixtures. 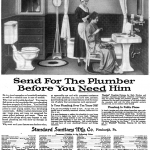 The Five Feet Square ads combined an appeal to luxury (extra baths for the lady who has everything) with an appeal to those homeowners still in smaller, older houses: you too, they said, can have glamorous indoor plumbing. All you need is a spare closet or the end of a hallway! Whether the campaign was successful or not, I don’t know. 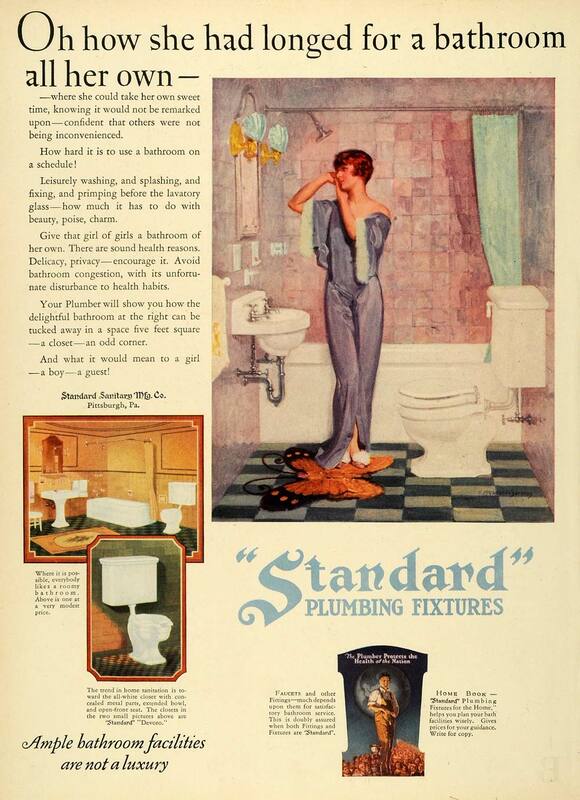 By the 1930s, Standard seems to have moved on to ads emphasizing color, Art Deco modernity, and the replacement of old, “unsightly” fixtures such as clawfoot tubs. If you want a bathroom in a room five feet square, though, American Standard (formerly Standard) still sells a tiny sink or two.